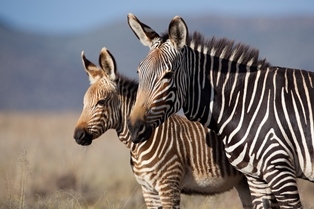 The Cape Mountain Zebra is one of South Africa’s most remarkable conservation stories. This beautiful animal was once abundant throughout the Eastern and Western Cape but declined drastically due to hunting and loss of habitat. The species faced extinction as numbers declined drastically to less than 60 individuals at the beginning of the 20th century. However, due to conservation efforts, an estimated 4 872 zebras in 76 sub-populations throughout South Africa was recorded in 2015. Their population grows an estimated 9% each year. Despite the population growth, the Cape Mountain Zebra is still currently listed as vulnerable by the International Union for the Conservation of Nature (ICUN). A lack of genetic diversity currently threatens the long-term survival of the species. Whats the difference between the Cape Mountain Zebra and other zebras? The Cape Mountain Zebra (Equus zebra zebra) is endemic to South Africa and is a subspecies of the Mountain Zebra (Equus zebra) which occurs in the great escarpment mountain ranges from the southwest of Angola, through Namibia, the Northern Cape of South Africa, and the Cape Fold mountains in the Western and Eastern Cape. Over time, two distinct subspecies, namely the Hartmann’s Mountain Zebra (Equus zebra hartmannae) to the north and Cape Mountain Zebra to the south, developed. The Cape Mountain Zebra is a smaller subspecies of zebra and also the most geographically restricted. They have distinctive features that make them stand out compared to their northern relative, the plains zebra. The bellies of the Cape Mountain Zebra are white and don’t have any stripes, whereas the stripes of the Plains Zebra run across its stomach. 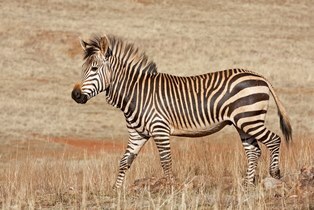 The stripes of the Cape Mountain Zebra are also narrower and more numerous than the Plains Zebra. The Cape Mountain Zebra Biodiversity Management Plan is led by CapeNature and various stakeholders that focus on actions and strategies that aim to strengthen the overall population, distribution and genetic diversity of the Cape Mountain Zebra. Through the Cape Mountain Zebra Biodiversity Management Plan, CapeNature identifies potential sites to introduce new or supplement current populations of Cape Mountain Zebra. At Gamkaberg, World Wide Fund South Africa (WWF-SA) has enabled the inclusion of some 9 502 hectares into the Gamkaberg to expand the grassy fynbos habitat and enhance the breeding prospects for this relict (original) population of zebras. What does the Cape mountain zebra conservation mean for others? The Cape Mountain Zebra is proof that well planned conservation can save our endangered species from the brink of extinction. Protecting the Cape Mountain Zebra, and conserving its habitat, means we also by extension protect other endangered animals in the Western Cape, such as the Cape vulture at De Hoop Nature Reserve, and the riverine rabbit in the Karoo. If you would like to participate in conservation work, you can volunteer and take part in initiatives such as Conservation@Work, a non-profit organisation that promotes and supports the conservation of private land in the Western Cape. Where in the Western Cape can you see the Cape Mountain Zebra? To book accommodation at the above mentioned reserves, feel free to contact CapeNature and SANParks to make a reservation prior to your visit.